Summer on the islands goes too quickly. Though we have been incredibly lucky to have had such a long summer (it is now the end of September and it is still GORGEOUS outside), I am selfishly wanting it to continue. Summer is not my favorite season necessarily, but this summer was particularly wonderful. I’m not sure if it is because my daughter turned three in June and has morphed into this amazing person with plans and jokes and “deals” and true personality, or if it is because I can see that our home is actually being built. One possibility is because we spent more time on Orcas and were able to enjoy the island on a daily basis. Either way, summer is coming to a close, and it is with a smile that we say “see you later.” Before we do though, I would like to share some of the highlights with you! I think her pirate name should be Curly! The beginning of summer for our little family is Eleanor’s birthday, which is in early June. We have a huge party with tons of friends and family. This year we had so many family members come in that we ended up with three “cabins” at Smuggler’s Villa on North Beach. We had octopus cupcakes, buried treasure, swimming pools, pillow towns, and probably 60 or more lovely souls over that day. My husband BBQ’d for all. We spent the long weekend playing at the beach, visiting with friends who live at “the Ditch” and enjoying the fire by the beach. It was a wonderful way to kick off summer, and it reaffirmed our love for the friends we have made on this island. Getting the buried treasure pool ready! One issue many people have on the island during the summer is adequate water supply. As we live on a family property that includes a large food-producing garden, we are counted in that number. The solution is hauling water. While it may not sound glamorous, it is actually a very fun family event! We gathered fairy dust and sprinkled it around, we built a fort beneath a grove of trees, and we enjoyed splashing around in the water! One man’s chore is another man’s adventure? Is that a saying?? We spent more time at Cascade Lake this summer than we have the entirety of our time back on Orcas. On Sunday afternoons, we would often pack up around 3:00pm or so after Cory had had his fill of digging around the foundation of our addition. We would bring with us buckets, blankets, babies, food, and drinks all packed in our little red wagon. We would BBQ, build sand castles, see old friends, and make new ones. Cascade Lake was good to us this summer. I hope we can continue to venture out there once the leaves fall. The hike around the lake is beautiful any time of year! We love the shady playground! “King Julien”cracks me up every time!! I learned this summer that my child is spoiled by living in such near proximity to the ocean. I cannot count how many times I tried to get her to go to the beach with me and she was not interested!!! Who doesn’t want to go to the beach at the drop of a hat at all times?! My kid. That’s who. I remember begging every day of summer as a child to go to the lake with my mom. I suppose I have to count all of us as fortunate if “too much beach time” is considered a problem! On our final days of summer, I was so happy to get in a last minute trip to Crescent Beach with Eleanor before dinner. On this day, she was very in to cleaning closed clams. Normally she likes to play in the ever-present driftwood structures, feed the birds by throwing dried seaweed in the air, or hunt for “crabbies.” This evening though, she stood in the water cleaning clams for extended periods of time. Maybe she knew it was one of the last times that her bare feet would be in the ocean for a while. Thank you Orcas Island for a beautiful season. We welcome fall with smiles. We’re ready for you, Fall! Looking out from one of the stunning viewpoints atop Orcas Island’s Turtleback Mountain or Mount Constitution, it’s easy to imagine that the evergreen archipelago spread out below you has existed as-is since time immemorial. Indeed, the rock you’re standing on may be more than 500 million years old! Far from being permanent, however, Orcas is part of a dynamic system that has changed in remarkable ways within the blink of an eye—geologically speaking. Ancient oceanic rock on Turtleback Mountain – from Mexico! For one thing, back when dinosaurs stomped around the landscape, Turtleback Mountain was at the bottom of the sea. And it was in Mexico. Yes, Orcas was once south of the border where Baja lies today! In fact, all of the San Juan Islands are still slowly sailing through the cool waters of the Salish Sea, moving northeast at about an inch-and-a-half a year. During the last ice age you could skate across Orcas Island, which was buried beneath a mile of ice. It was the advance and retreat of glaciers that ultimately shaped the dramatic setting you see today, smoothing and scarring the rocky highlands while excavating the deep channels that eventually filled with seawater and turned hilltops into islands. Not too long ago, our island wasn’t even an island. Orcas was part of a larger land mass upon which very large—but now extinct—animals such as giant ground sloths, short-faced bears, mammoths, and herds of nine-foot-tall buffalo roamed. A fascinating archeological discovery was made on the east side of Orcas in 2003. Though a dozen Orcas sites have unearthed remains of the extinct giant bison, Bison antiquus, bison bones found at the Ayer Pond in Olga were the first to show evidence of human butchering. The significance of this discovery is that it puts humans in the Salish Sea by 14,000 years ago — a thousand years earlier than previously believed. While I’m still trying to figure that out, I realize I’m actually already doing it: living a simple life on Orcas Island, with a genuine love for the world around me. Dreaming of the simple life on Orcas Island? Contact me to help find your way home. Sharing life, love and lunch. I love Pizza – Who Doesn’t! Ok, so I don’t need to eat more carbs, and yes we have Hogstone Pizza in town. So why, you ask, do I crave to create the best ever pizza??? Last time I was in Darville’s Bookstore I found a book about pizza titled Pizza Camp by Joe Beddin. I love to read cookbooks, especially when they have humorous commentary and throw in common sense. After reading Joe’s recipe and constitution on how and what to use to make the best-ever pie I started planning and dreaming. So let the fun begin! I have never had any luck with yeast. So the fact that Joe’s recipe for the dough does not include warm water and is put in the fridge for 24 hours gave me even more skepticism. However, I jumped in and made the first steps towards my crusty cheesy tomato dreams. Joe’s policy for making dough: “Turn your phone off and don’t speak, this is a time to listen, for new ideas, it’s not busy, be present. Making dough should be calming, meditative and a great time to think of new ideas about pizza and life.” I spent the time to enjoy the moment and think about what my garden would provide as toppings. Book in hand, tools in place. This is the beginning, bring on the yeast. Love it when your work looks like it does in the book! Garlic drying in the sun. Going to learn to braid this summer! The sauce. I always thought you cooked up a batch of grandma’s secret tomato sauce and let it simmer for hours on the cooktop. No, Joe says they never cook the sauce in Naples. He recommends a nice fresh and bright tomato sauce, which comes with using the right tomatoes. So I read on. Joe uses Jersey Fresh crushed tomatoes in a can. A CAN!!! Ok, I can do this, FYI- I did go to Maple Rock Farm stand down the road and purchased fresh island grown tomatoes. Just in case. Continuing to read more from Pizza Camp, I learn the canned tomatoes, garlic and salt need to sit for a few hours in the fridge to meld flavors. I found canned tomatoes at Island Market from Italy – yes in a can. Cheese will include fresh mozzarella and a hard cheese purchased at Roses Bakery. I think I will search for some local fresh goat cheese for the next time – Wendy Thomas, I’m headed out your way soon, girl. Now what will I choose for toppings? Well I think a simple marguerita is a must. Just cheese and fresh basil – I can do this, and get a chance to go thank my garden once again for providing me with peace of mind and room for dreaming and creating good food. I wanted something a bit more for the second disc of saucy goodness, so I pulled some local pork out of the freezer. Pizza Camp shares many styles and types of toppings, one being Pizzeria Beddin’s Sausage – perfect! Anticipation is a wonderful thing. I could not enjoy this pizza experience by myself so made a short last minute call to Cory, Monee and Eleanor to come to Gramma T’s back yard bbq pizza oven. I believe this can work with my cast-iron flat pan. Yes, why not. Too early in the game to order a wood fired pizza oven to be constructed in my patio (save these dreams for when I am making dough). This was the hardest part and I have to say, I cheated and used my Grandma’s rolling pin. Need to do some recon on what is the trick to pushing, pulling and stretching the dough. You need a pizza peel. I’ll save you the details on this, just believe me. And, do not grease your pan with olive oil. Avocado oil will stand the heat much better. The two days of planning was a tasty success. I still love pizza and am already dreaming up the next PIZZA CAMP! You start on the mainland, bags packed and ready to go have some fun with Grama T and Grampa J. at their Orcas Farm. Since there are so many dirt roads on Orcas, Grama’s car is filthy, so we need to run it through a car wash. Be sure to make time for that and fueling up. In July, a stop at the berry stand is a priority, even if you’re riding in a dirty car and running on fumes, you still stop for berries. The car is loaded and headed to Lane 3 (or whatever lane they are using today for reservation holders). Those of us who have had many ferry rides remember the days when Lane 3 was for Orcas only. One of the best things about having a Grama who lives on Orcas is that she probably is into everything and this year was no disappointment. Grama T is on the Board of Lahari, a non-profit that supports aging in your home. Lucky for us, she and Grampa were entered into the 4th of July Parade in Gramps’ old Model A. This Model A has parade history with long-time Islanders Wilma and Buck Ray, and is one of many “island rides” Gramps has collected. Lahari’s new program is Orcas Door to Door, and is designed to pick up and deliver seniors to appointments and events. Car loaded down with bling, off we went down North Beach Road through Eastsound, horn a-tootin! Orcas Island’s 4th of July Parade always ends the Mayoral Race where we elect our new Mayor for the year. This is a fundraiser for Children’s House and gets all ages out and involved in our local pets and politics. Congrats to Hudson, our new Mayor. Back at Grama’s house, we spent the remainder of the day playing in last year’s 4th of July Parade First Place float, the playhouse. There is always something going on here! We also had a chance to check out next year’s parade entry – an old fire truck that was used at a private residence years ago for fire protection. I wonder what Grama and Gramps will dream up for next year’s parade entry. Collecting island memorabilia and sharing history is a big part of this island family life. And, lucky for us Grampa knows the nice people at Island Hardware and Supply and he has a truck (well a few he’s collected). Grampa just called those people up to check on swimming pools, then came home with one for us! It is always hot on the 4th! The last weekend in June, the Garden Club showcases local gardens and raises funds for projects and grants to island non-profits, including the “Farm to Cafeteria” garden at the public school, a seed library at the library, rain gardens in Eastsound Village, and many other wonderful projects. The Garden Club meets monthly and members have a wealth of knowledge and local know-how for growing flowers, vegetables, fruit and native plants. Grama T showed us how to pick peas and raspberries in her garden. Although not on the tour, she has many remedies for growing and eating. This year she has a few choice words for the raccoons who enjoyed all the Rainier cherries before Grampa could get out and protect the tree trunks. There’s always a good meal in Grama’s back patio with BBQ of local beef brisket, greens from the garden, roasted baby potatoes-carrots-leeks-garlic-broccoli, peas right out of the pod, raspberries and Roses’ bread. Desert was Lopez Island Creamery ice cream smothered in strawberries. Family, food, friends. Does not get better than that! When the summer days get too hot, Grama always knows where the best beaches are on Orcas. This time she took us to Westsound near the Orcas Island Yacht Club. There are two docks located there, the OI Yacht Club’s and a County public dock. Grama and Gramps sometimes take their sailboat, the Blue Pearl, to Westsound and hang out on these docks – easy walking to the Westsound Café. Also, deep into Westsound is Massacre Bay where you are sure to get some wind. Today we just collected shells and searched for sea creatures. This beach is usually empty and is quite sizable at low tide. Clam digging and crabbing are my favorites. Hope we get to do that next time. Today we made friends. If you are going to visit your Grama be sure to tell her all about the island fun, family, friends and food that is happening for kids on Orcas! One of my favorite things about Summer on Orcas is the Farmer’s Market. We spend many of our Saturday’s at the Village Green socializing, eating, and playing. Some days we have beautiful blue skies, and other days we are convinced October came early, but regardless, it is always a good time. Piggy backs, face paint, and ice cream. Typical Saturday! Manning the booth in May before our tent was even ready! It was cloudy in the morning, then sunny and warm. Confusing!! I set out last weekend to get pictures of my top five favorite booths, but then quickly realized that there was no way I could narrow down my choices. I ended up running around chatting with everyone as I helped to man the Children’s House Mayor’s Race booth, as I often do. The result was a dead phone and no where near photos of all of the amazing vendors. I may have to make this a series of posts about our glorious market, which would be just fine by me. The “Talking Tree” I believe is what the local kids call this amazing tree at the entrance of the Village Green. First things first. No trip to the Market would be complete without a trip to see Stephie. Our daughter LOVES Stephie. She is the local Face Paint Artist. She can make you a pirate, a panda, or as our daughter regularly requests, an Octopus. Selfies with the Lum lambs! Another favorite is Tai Carson of Rogue Soul Designs. She is a midwife-turned-jeweler and all-around great gal. Her jewelry is beautiful and she has a knack for hunting down fantastic fabrics as well. Someone snag up that green jade bracelet before I do! The beautiful indigo you see behind Tai’s work is by miss Natalie Menacho. She is a peach. She not only makes amazing indigo dyed works such as hand bags, kitchen towels, napkins, and the like, but she also does branding, fine art, illustration and so on. She is a creative gal, and someone worth chatting with. Stop by her booth and say hello! Another fan favorite in our family is the Lum Farm owned by Eric and Amy Lum. This spring they saved three baby lambs that were more than the mother Ewe could care for, and brought them not only to the Farmer’s Market but to my daughter’s toddler center. They are a wonderful community family, and a delightful addition to the Farmer’s Market. Feeding baby lambs is such a treat! One of the smallest booths at the Market has the most amazing things inside of it. Carla’s Art is all about Orcas. I dare you to step inside and not find something to fall in love with. She has notebooks, maps, cards, mugs, and more! She is a fascinating woman, and I am glad that she is sharing her work with the world. 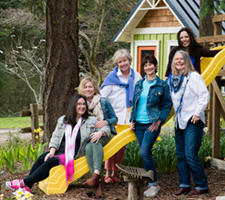 And last but not least (for this post) is Orcas Island Children’s House. They host the annual Honorary Mayor’s Race for our lovely island, where we shamelessly buy our candidate in to office! We elect local animals to govern the small town of Eastsound, and we wouldn’t have it any other way. Children’s House is an island institution that offers a play-based learning center for waddlers, toddlers, and pre-schoolers. If you ever want to meet the sweetest, most generous, loving women in the world stop by the school or our booth this summer! If you would like to vote for Mayor, or support early education for our island kids in general, you can do so here! Tyrone – A local favorite to take the race! Hudson has the best outfits (and swag)!! Last summer I listed and sold a property in Crow Valley on Quick Three Beers Lane. I was tickled by the creative address, and as a bird lover I knew right away the name had nothing to do with a cold brew. Quick Three Beers is a birder’s phrase for the three-beat song of the elusive Olive-Sided Flycatcher, my favorite feathered summer resident on the island (click here to hear the song at Cornell Lab of Ornithology). These remarkable birds fly from as far as South America each summer to nest in northern places such as Orcas Island. As soon as they land, their mating calls begin. If you’ve spent any time here in May through August, you’ve certainly heard them. Actually spotting one, though, is a challenge. The Flycatcher perches high in the tree tops, and its camo colors make it all the more challenging to find. It took a few summers of living here before I caught a glimpse of my first O-S Flycatcher. I followed the sound through the woods and waited for the bird to take flight, catch its snack and return back to its perch – a feeding routine it repeated again and again. The bird has a distinctive head shape, and I became successful at identifying it from a distance. But I wasn’t able to get a really satisfying look. Until recently. Situated at the top of a ravine and nearly eye-level with the upper canopy of the trees below, our living room is an ideal bird watching spot. Last week an Olive-Side Flycatcher claimed a nearby bare madrone branch for an afternoon of hunting, and I was thrilled to finally get closer to the bird I cherish. We’ve kept a wildlife log for the last 11 years, marking the arrival and departure of migrating birds on our property along with other events in nature. Though the Flycatcher’s numbers in the world are diminishing quickly due to loss of winter habitat, so far without fail, they arrive in May to nest on our property. Their mating calls signify the arrival of summer to me, and always make me smile. Do you love birdwatching? The San Juan Islands are part of the Pacific Flyway and a great place to watch birds year round. Contact me to find your very own perch. OK, yes. It is. But…It took forever!! After the longest winter in history (yes, history), we have finally seen some sun break through the massive storms of wind and rain (and snow). Some days required winter jackets even in the sun, and others were tolerable with simple layers. Regardless of attire, I think we are all glad to be done with Winter and moving on with this year!! Our nice days have been spotty so far, but we have managed to get a lot of time out of the house. When there has been less than a week of sunny days since October (give or take), you get out while you can! We have gone through endless ounces of bubbles, checked every tree for buds, painted rocks for gramma’s garden beds, and even managed a beach day out in Deer Harbor last weekend. We also visited friends off island and played with their baby bunnies!! With Winter behind us, it is so nice to get a glimpse at what the coming months will be like – outside all of the time!! We have begun to plant in our yard. I hesitate to say “we are gardening” because, we really can’t. We are planning on building soon and I would cry if our gardens were ruined by construction. I am happy just to dig and get dirty here and there. We have had fun checking on our daffodils, which are just now finally blooming! Eleanor’s grounded play boat will soon be surrounded by yellow petals! We have transplanted raspberries both in the ground and in pots. And with Earth Day nearing closer, we shall be planting a tree together soon. I love springtime with a toddler. The tasks may take longer, but that’s ok. Today instead of simply gathering dirt from the compost for raspberries, we hunted for dinosaurs. We found Dino City in the field of tall grass and left T-Rex a butterfly net full of fir cones to munch on. We skate boarded on the porch. We painted. We fell off of swings, cried, and got back up. We enjoyed wagon rides, found apple trees blossoming, made popcorn out of driveway rocks. The imagination (and stamina) of a toddler is to be admired. We also managed to plant the berries. When the time finally came to replace the ailing Channel Road Bridge in Deer Harbor, San Juan County took the high road. Instead of top-down decision-making, County Councilman Rick Hughes encouraged Public Works to reach out to the community and let the residents guide the aesthetics of the bridge. This engagement process added a year in planning, but resulted in citizens taking ownership and pride in a bridge that they, in a sense, helped build. Providing the sole access for hundreds of residents on the southwest side of Orcas Island (including yours truly), the Channel Road Bridge crosses the inlet to Cayou Lagoon. The old 52-foot-long timber bridge not only had a deteriorated structure, it was built using excessive fill that reduced the natural channel width by 50 percent, constricting tidal flow in and out of the lagoon. After nearly five decades, the lagoon was literally choking to death with buildup of fine sediment and resulting poor water quality. The new concrete bridge is 80 feet long and restores natural tidal flows which, over time, is expected to reduce sediment accumulation and increase habitat for juvenile salmon, forage fish, shellfish and shorebirds. The bridge was also designed with an increased width to allow pedestrians to safely cross as well as pause and enjoy the views and wildlife. County Engineer Colin Huntemer held numerous meetings at the Deer Harbor Community Club to present possible designs and get feedback. He credits the citizen-based Deer Harbor Plan Review Committee for playing an essential role in the entire process. The community input included selecting the color/pattern of the stamped concrete supporting walls and a unique style of timber guardrail that pays homage to the old timber bridge. Once construction began, County Engineer John Van Lund sent out a weekly update highlighting the prior week’s accomplishments and letting us know the next steps, including any required closures or traffic delays. When I contacted John over the Christmas holidays to ask that the expanding potholes get fixed, the holes were filled the NEXT DAY. Residents were so thrilled with the community engagement and construction process, some brought the workers cookies and sent letters of thanks. With the bridge now complete, we can enjoy safe passage for cars, pedestrians and our finned friends. Kudos to the Public Works staff for setting a shining example of how government can work in partnership with the people.